Therapy assisted by a dog could be more effective than standard speech and language therapy for children with communication impairments, suggests a new study published in the journal Anthrozoös. The study found children with the condition developmental dysphasia, which affects the ability to communicate and form words, were more likely to be able to mimic communicative signals in a therapy session where a dog was present. Researchers observed that the children in the group with the therapy dog also seemed more motivated and open to communicating. Additionally, the children displayed authentic, natural expressions during their interactions with the dog. In this study, researchers at Czech University conducted the first long-term randomized study of its kind, with a control and an experimental group, involving 69 nursery-school children (52 male and 17 female) participants diagnosed with developmental dysphasia. The aim was to understand if undergoing speech therapy accompanied by a dog improved results. For both groups, the initial examination of each child involved evaluating their skills at baseline, with a follow-up scheduled for 10 months later. The control group received traditional speech therapy, while the experimental group had animal assistance therapy sessions with a female middle-aged Peruvian hairless dog named Agáta. Despite the promising findings from this study, as this is the first of its kind and there were improvements found in both groups, the authors have stated that further research would be needed to consolidate the findings – especially those involving a larger group of participants. However, they do agree that there is great potential in the approach to complement and aid the current conventional approach, as canine-assisted therapy has been found to be more effective than more standard forms of delivery in many other disciplines. Developmental dysphasia, or specific speech impairment, is a common disorder whereby sufferers struggle to formulate words verbally and rank significantly below their non-verbal intellectual level. It is widely thought that the ability to improve communication skills in sufferers would also help to improve quality of life which strongly supports funding more research into this area. 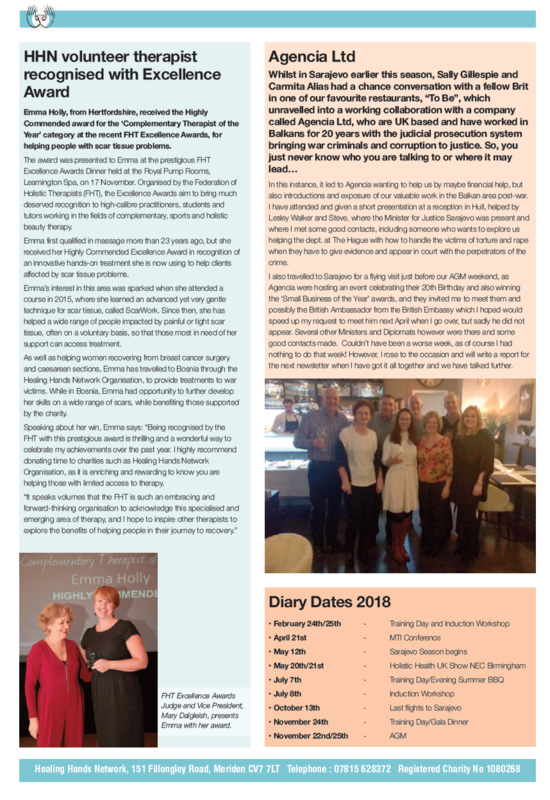 Emma Holly, Highly Commended for 2017 FHT Complementary Therapist of the Year, has been featured in Hertfordshire Life magazine for her work with charities. The local publication highlights ScarWork, a unique therapy with only around 100 qualified practitioners in Britain. Ayurveda is an ancient Indian holistic system, based on achieving physical and mental harmony with nature and has been practised for more than 5,000 years. Ayurveda quite literally translates as ‘science of life’ (‘Ayu’ meaning life and ‘Veda’ meaning science), and was first recorded in the Vedas, the world’s oldest surviving literature. One component of this system with numerous benefits is Ayurvedic massage. We help Natural Health magazine readers ease into this relaxing and re-balancing therapy with a full page feature, detailing what to expect during an Ayurvedic massage treatment session and how it can form part of a more holistic lifestyle. Read our Ayurvedic massage feature here. Have you always wanted to try reiki, but didn’t know what to expect? You can learn all about this wonderful therapy in our latest contribution to In The Moment magazine. And in their seventh issue, readers will find an introduction to reiki. Our own Karen Young, editor of International Therapist magazine, and Julie McFadden, the FHT’s resident reiki master, discuss what you can expect from a reiki treatment, as well as things to avoid. Reiki is one of the therapies on our Complementary Healthcare Therapist Register. 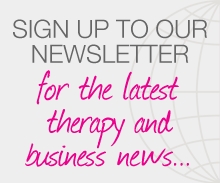 Find out more about our Accredited Register here, and read our reiki feature here. Healing Hands Network has featured one of our 2017 FHT Excellence Awards winners. Emma Holly, Highly Commended for Complementary Therapist of the Year, discusses her introduction to ScarWork, as well as what winning the award means to her. Read their feature here. You can also catch Emma on Radio Verulam (92.6FM) soon. On 16 January at 11am she’ll be discussing her prestigious award from the FHT as well as her charity work supporting women after breast cancer surgery in St Albans. Learn more about the show she’ll be on, Verulam in the Morning, and listen in on their website. Recently, the FHT contributed to the Guardian’s ‘New Year, New You’ supplement. It contained advice on de-stressing, self-care, and mindfulness. New Year, new you…new local support group? It’s that time again! We’re all putting on our mindfulness caps and deciding what our New Year’s resolutions will be. If your resolution is to be more active in the community, perhaps now is the time to start a local support group in your area? FHT Local Support Groups (LSGs) are a valuable hub for our members, students and even the public, where all those with a passion for therapies can meet and hear from speakers on various topics within the fields of complementary, beauty and sports therapy. Feeling part of a large therapy community… and having fun! Ready to dive in? You can read more about becoming an LSG coordinator on our website. Coordinators must be full FHT members, so if you haven’t already, join us now!